Day sixteen of our Simple Play :: complex learning series is all about cool things to do with a big roll of paper. 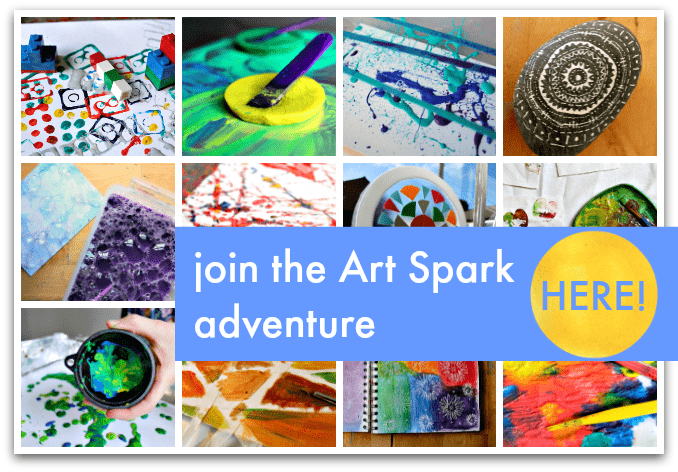 >>> Join my Art Spark adventure here! One of my daughters favourite things to do is roll out a BIG sheet of paper. There’s something about the scale which she loves. Very often we choose small pieces of paper for our children’s art and drawing, but sometimes it’s really good to go big. 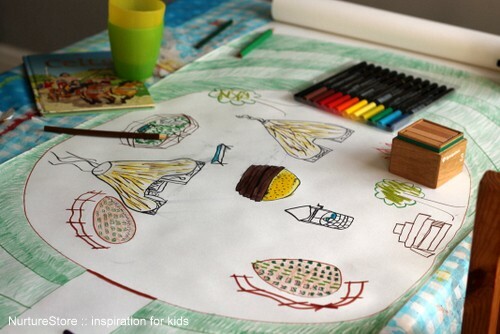 It invites children to be bold, to experiment and have the confidence to fill the whole page. It’s such a simple art material but it encourages an abundance of creative projects. 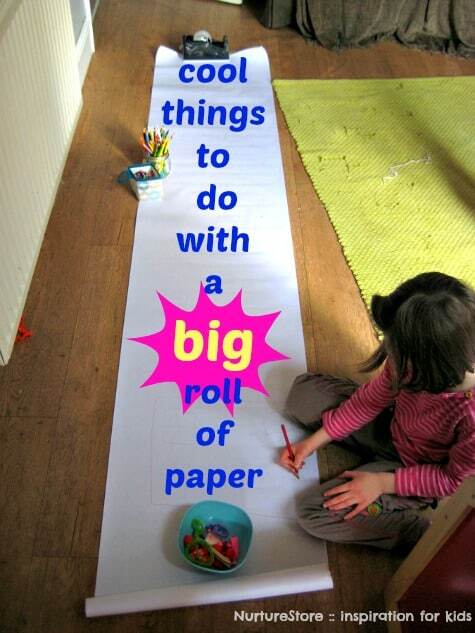 Here are some of our favourite ways to use a big roll of paper. The simplest, and perhaps my daughter’s favourite, way to use a big roll of paper is to lay down a drop cloth, roll out your canvas and add in some paints. You can lie right alongside and relax while you create. 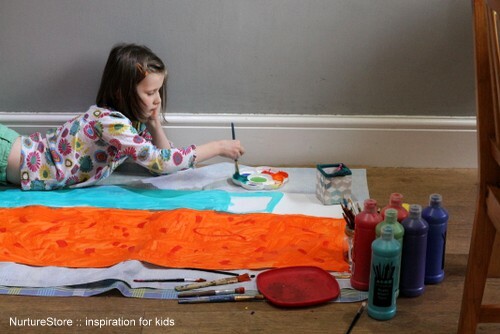 Another fun idea is to have your child lie down on the paper and draw round them. They can then draw on a fancy outfit, or transform themselves into a favourite character. 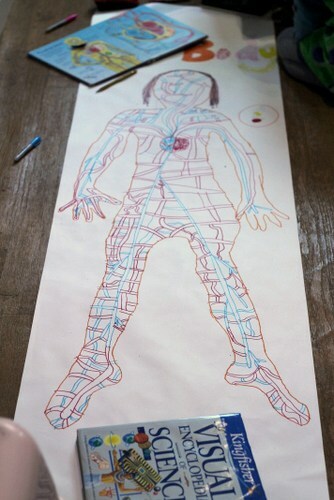 It’s also a great visual learning activity to add in with an all-about-me or body science project. 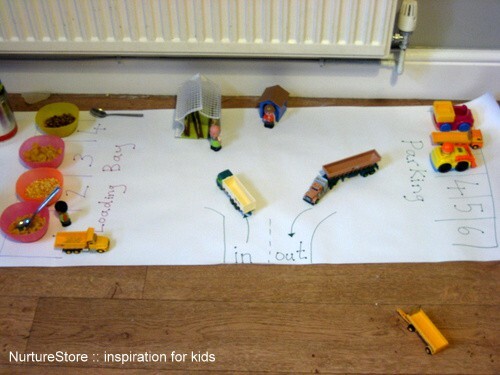 A roll of paper is also great for making imaginary play lands, as you can draw on any world you like. Hop on over to see how we added in play, maths and literacy to our delivery depot. How about using it as part of a history project? We used ours to draw out a hill fort when we were studying the Celts. The size of the paper allows plenty of space to include lots of historical detail in the picture, and is an excellent for visual learning, as you can incorporate all the facts you have learnt within your art. 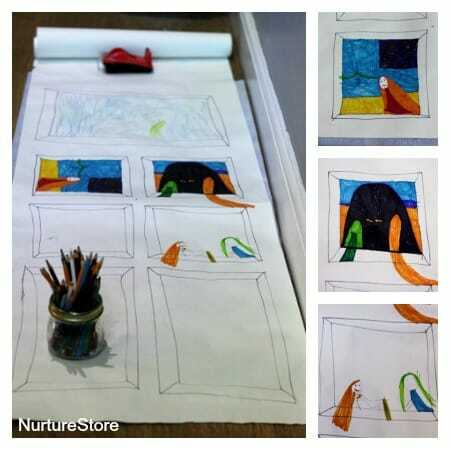 For creative writing and story telling, how about drawing out a set of picture frames to create a gallery. You can then use each frame in sequence to draw in a scene and tell your story. 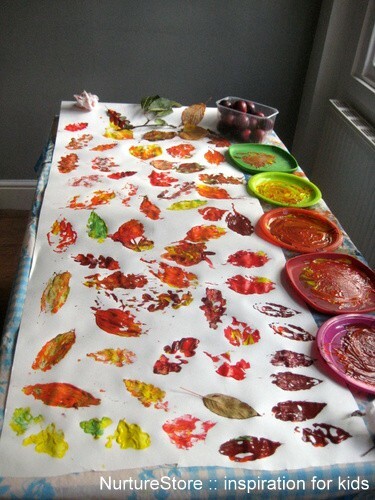 And what about combining it with loose parts, to make an interactive play mural. 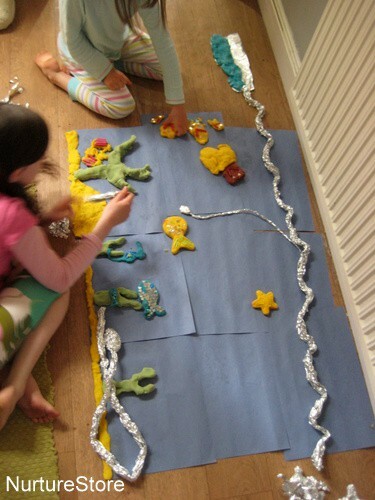 Here we combined play dough and tin foil to create an underwater scene, with moveable parts so the children could play and tell stories. This is a great list, even for older kids like mine. Thanks Phyllis. One of the reasons I love a roll of paper so much is because it really is great for all ages. A reader over on Facebook says her daughter and grandfather enjoy drawing play towns together! Don’t forget table cover/cloth! We cover our table all the time to doodle and decorate on it. Sometimes its seasonal, or holiday specific. Its a great conversation starter at meal times. That’s a great idea Heather! Thanks for the tips. I hope to use the leaf one in the fall. I’m preparing to bring out our paper roll this afternoon, and remembered K and I doing large drawings on the floor a couple years ago 🙂 http://francineclouden.typepad.com/callaloo_soup/2012/05/toddler-time-drawing-and-stamping-on-the-floor.html I love the idea with the frames, I think that’s what we might do today! We like to use our hands and feet and make prints. It is fun to learn about other animals and the prints they make too. Thanks for sharing. A roll is great to use as a game board. Create a wandering path with all sorts of adventures as you move by rolling dice or use a spinner. You can also use the text on the board (A frog jumped up and scared you – jump forward 3, or you got caught in the mud – go back 2. In my town I can go the a book printing company and ask for their end rolls which are too small for them to use and we can pick up as many rolls and we want whenever we need more for FREE. Check it out in your town! Lucky you Mary! Thanks for sharing the great tip. I used a large roll of paper with the children to make a humungous dinosaur. We looked up the Triceratops is ~ 9mt long so rolled out the paper, with a black texta drew a ‘version’ of it and the children roller painted it. Then rolled out some more paper and the children made their own dinosaurs. It was a great activity in getting the concept of size. That is such a great idea Jennie! Reading this blogpost brought back some lovely memories. 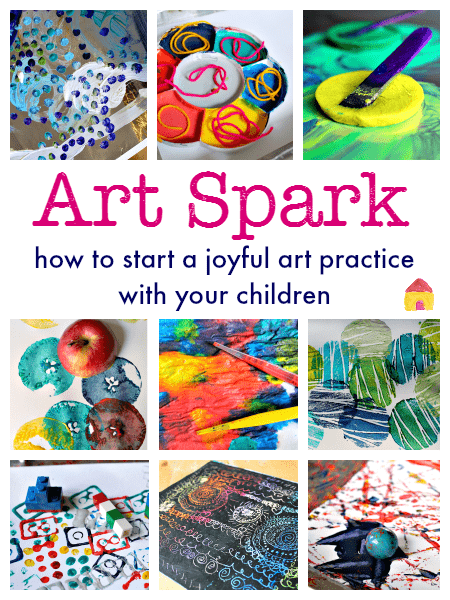 I remember my auntie drawing around me and my brother and I spending hours colouring it in … hopefully I will be able to do this with my godson when he is older or use some of your other brilliant ideas with my students! Our paper recycling place has loads of these rolls for free. We use them mostly for painting projects. My older son was in a class that used it for solar system drawings. I love these ideas. We have done just coloring, painting and body outlines but the other ideas were fantastic and I hope to try many of them soon. I have a huge nature lover so I think the leaves in paint will be a good one. Maybe they will even draw animals “within” the leaves. Maybe we can draw four windows of different seasons. Thanks again for the ideas.